I think we are a very cosmopolitan group: from many descents, from many religious beliefs, from different countries, first time immigrants (I know one, really well ), speaking different languages. How about we try to learn more about our friends while speaking about our own traditions, in our native language using the Alphabet Game. AJUN the night before Christmas day, Romanian word meaning the day which precedes an event, or Eve. Traditionally we celebrate Christmas Eve, people attend the evening mass, they go around singing carols, then have dinner, Santa stops by, then presents are being opened. with "the freshest of food and the oldest of drink!" Am I missing what Irish word begins with "C"? And I dare ya' to be tellin' me that ain't IRISH!!! I think Nancy thought "Christmas" was next letter to talk about! Dobos tort is one of the deserts we make at big holidays, Christmas being one of them, a delicious layered chocolate cake with a crusty caramel on top! Joyeux Noël, means Merry Christmas, my mother was French, my father's family was Dutch. vrolijk kerstfeest means Happy Christmas. Yoyeux Noel elvan and Vrolijk Kerstfeest! I think we may have lost the "ALPHABET" part of this game Daniela!!! So let me just share that on Christmas Eve my whole family gets together.....we rotate the house every year. All of our cousins, aunts and uncles etc try to come. When I was little, this was done at my Grandparents and everyone DID come because everyone lived in our tiny town. These days, many have moved out of the area but everyone TRIES to be there still together for Christmas Eve. We no longer give presents to each.....with over 60 people attending sometimes....that would be too hard. We all buy for the little ones......the kids. Some of us exchange with each other...I give all my female cousins a SMALL gift.....cinnamon ornament, special soap (this year it is soap in the shape of a cinnamon bun---DON'T TELL!!!). Everyone brings a dish so the host/hostess does not provide the food.....only the space and the dishes. It's the company we care about...not the food. At midnight many of us go to midnight Mass together. On Christmas Day----we celebrate with our own smaller families. In Mexico today is a very special day - the Day of Our Lady of Guadalupe who reportedly appeared to Juan Diego, a native Mexican peasant, 4 times and to his uncle once. It's said that she spoke to Juan Diego in his native Nahuatl language (the language of the Aztec empire). Festivities include more than 10 million people visiting the Basilica of Mexico in Mexico City on a hill called Tepeyec on December 12 where the Virgin first appeared December 9, 1531, only nine Years after the Spanish conquest which ended August 13, 1522. We remember the date of 12/12 because that is the day that Juan Diego's uncle upon his deathbed asked Juan Diego to fetch a priest for last confession. On his way to the City of Tlatelolco the Virgin again appeared to Juan Diego and chided him for not trusting in her, "Am I not here, I who am your mother?" and she told him to gather Castilian roses from the top of Tepeyac Hill, which was normally barren in the winter. 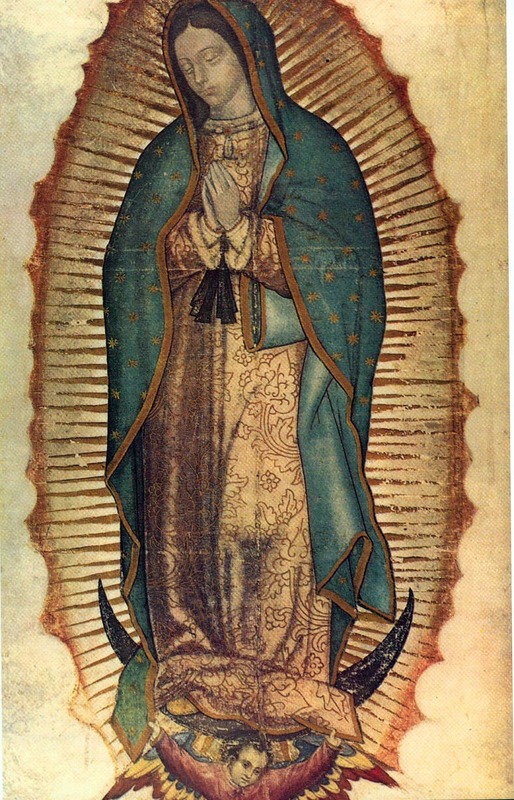 The Virgin arranged the flowers in Juan's tilma, or cloak, and when Juan Diego opened his cloak before archbishop Zumárraga in Tlatelolco on December 12, the flowers fell to the floor, and on the fabric was the famous image of the Virgin of Guadalupe. When Juan Diego returned to his uncle, Don Juan Bernardino was fully recovered and confirmed that he, too, had seen the apparition of the Virgin. Thus begins the festivities of Mexican Holiday Season which goes until Epiphany on January 6th celebrating the visit of the Magi and the day of gift giving in Mexico. I am fortunate enough to have my Birthday only 2 days after the apparition in the midst of much celebration and family time. The basilica built the the hill of Tepeyec is the most visited Catholic pilgrimage site in the world, and the world's third most-visited sacred site with an expected crowd of 300,000 people today - many crawling on their knees to venerate the image left almost 500 years ago by the Virgin of the New World!